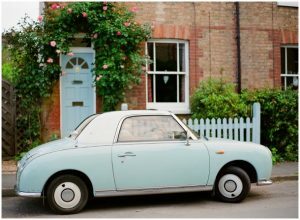 Chanelle’s background is the design departments of top ad agencies around London as well as for world-famous photographer, Mario Testino. Brands include Versace, D&G and Vogue. Chanelle ran a successful photography business in the UK for 10 years and photographed weddings around the world including many exotic locations such as Bali, Santorini and Morocco. 90% of her weddings were published in glossy wedding magazines, and she was commissioned by You & Your Wedding Magazine to shoot the back fashion pages. 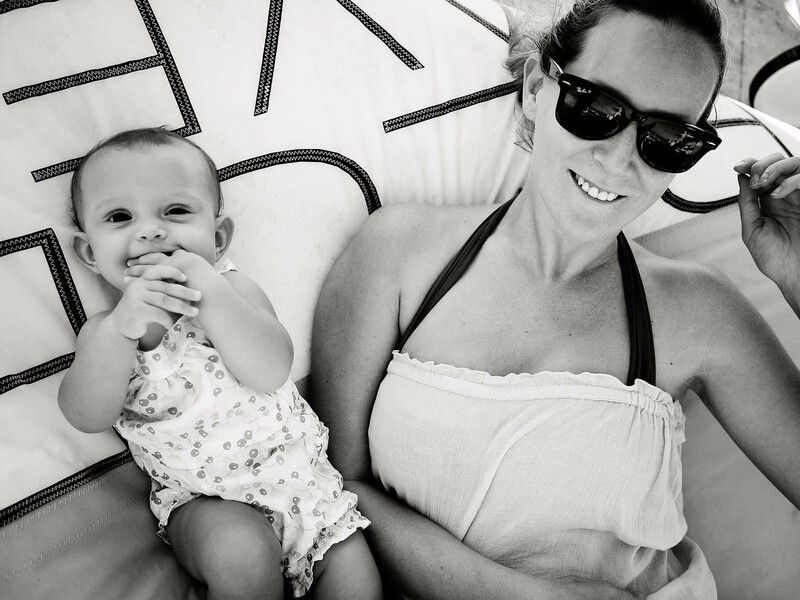 A warmer climate was calling and a big move across the pond led Chanelle to work for a studio in The Turks & Caicos in the Caribbean for 2.5 years where her daughter was born. Chanelle hired a high-level business coach, launched a Social Media Marketing company and moved back home to South Africa in early 2015. She's since built a 6-Figure Coaching Business (in USD), living on the beach in J Bay! 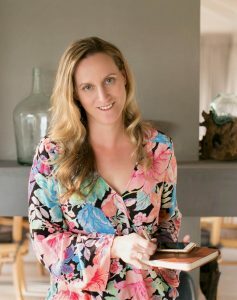 Chanelle now uses her 19 years of experience in design, marketing, branding and business to coach women from around the world on how they can create their version of an extraordinary freedom based lifestyle through entrepreneurship. I've changed career paths a few times, moved to 3 continents and had a baby in the middle of it! Finished high school, did a diploma in Graphic Design / Artworking. Switched on my first Apple. Left Durban, South Africa with my boyfriend at the time (now husband). Worked at a print shop in Baker Street creating letterheads and business cards. I walked home to Marylebone every day and we had a W1 postcode, although it was the size of a shoebox. Moved jobs to a DVD packaging company working 12-hour night shifts on clients such as MGM, FOX, and Paramount. Guys would throw grapes at co-workers who looked like they might be nodding off at 3am. I found an online mentor, mastered the art and got a full-time role at THE BODY SHOP head office in London which left me with a year’s worth of strawberry body butter after I resigned. Best decision ever. Doubled my income, had time, freedom and could take holidays whenever I wanted. A highlight was seeing one of my retouched images for Dolce & Gabbana on a huge billboard when we went to Venice! My husband and I photographed weddings all over the UK as well as shooting destination weddings around the world including locations like Bali, Mauritius, Morocco, Santorini, and Prague. 90% of our weddings were published in glossy wedding magazines and on international blogs. I began shooting styled bridal fashion and just before we left the UK, I was commissioned by You & Your Wedding Magazine to shoot bridal fashion spreads with Peta Hunt as the stylist! We shipped off to The Turks & Caicos Islands in The Caribbean where my daughter, Saharah was born. We worked for an established studio there shooting families, weddings and commercial. 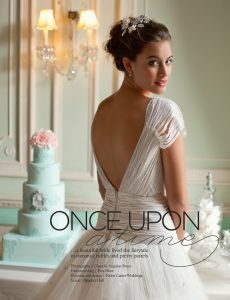 I set up 3 large styled shoots with gowns shipped across the pond from the UK, which all got published internationally. I worked on the re-brand for the studio’s website, coming up with look and feel, design ideas and a brief for the web designers. 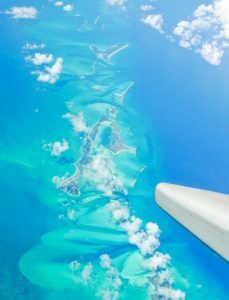 Saharah was born on the beautiful Caribbean Island of Providenciales. I had 6-months off to be with her and then went back to the studio part time. Eventually working more and more hours but not reaping any financial rewards. I knew I wanted to go back to having my own business and enjoy the freedom that brings. Got clear on what I really wanted from life, brainstormed the idea for my new business: A Social Media Marketing Agency. I employed two full-time staff and we served up to 10 clients per month doing all of their blogging and social media for them. Our clients were based in the UK, Spain, USA and the Caribbean. 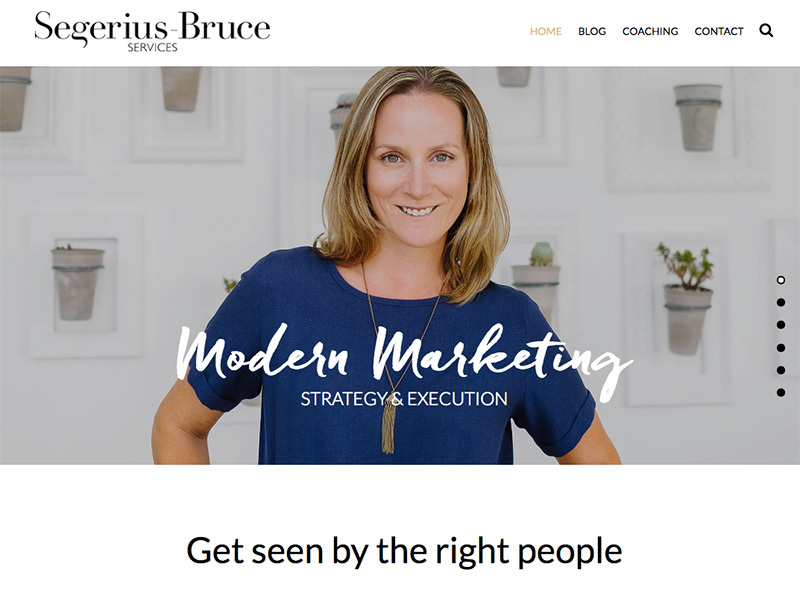 Launched Segerius Bruce Services offering blogging and social media marketing. 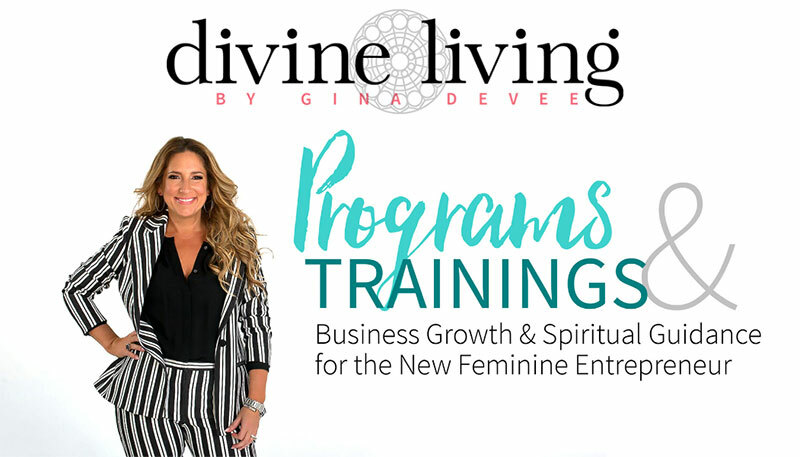 Joined The Divine Living Academy Online by Gina Devee and immersed myself in the year-long course materials and learned as much as I could about coaching, personal development, branding and online marketing. On how to create a jaw-dropping personal brand, how to get clients and create their versions of an extraordinary life! In October 2016 I had my first $17K month in sales. My clients are enjoying incredible results taking their ideas and moving into action so that they can make more money and live an extraordinary life, one day at a time. 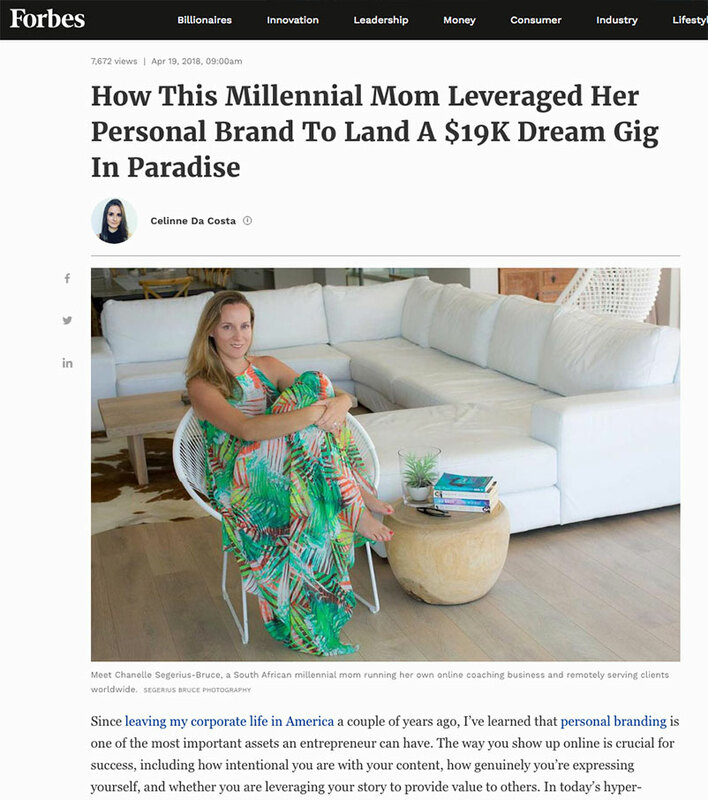 $19K Personal Brand Creation Project: I worked with a beautiful client who flew out from Seatle, USA, to meet us in The Seychelles. I did the personal branding shoot and Craig did a lifestyle story video with drone footage at an exclusive villa on Praslin Island. I facilitated a one-day coaching intensive with my client to get clear on her brand message, story and strategy going forward. When I returned home we coached via Skype and I built her brand from the ground up including website design + development, logo, SEO and opt-in pages for list building. I moved away from done-for-you services, simplified my life and I now concentrate on coaching / consulting as well as teaching via group programs. I love the ripple effect that my coaching support has on the women I work with from around the world! THEN YOU BETTER GO AND LIVE YOUR DREAM LIFE! Gone are the days of shooting 12-hour weddings on weekends, feeling like I’d been run over by a bus every Sunday, and editing pictures all week long! I’m designing a life that I want and I’ve created a business that supports it. ONCE SAHARAH WAS BORN, THINGS SHIFTED. I want freedom. I don’t want to be limited to a small number of days off per year or to have to ask permission every time I want to go on holiday. Do you find yourself feeling a bit “over it” sometimes? I help you avoid feeling overwhelmed and burnt-out. Business coaching is more than learning about marketing and branding. It’s also here to protect you as a person. I’m still learning the ropes of being a mom, having a business and creating space for myself in the process. I DIDN'T HAVE A BABY FOR SOMEBODY ELSE TO BRING UP! I want to be with her every afternoon like my own mother was for me. My husband gets to work from home too and we’re able to share quality time with our toddler. I realise this is a privilege, some would say an extraordinary circumstance. Extraordinary is what I'm striving for, one day at a time!